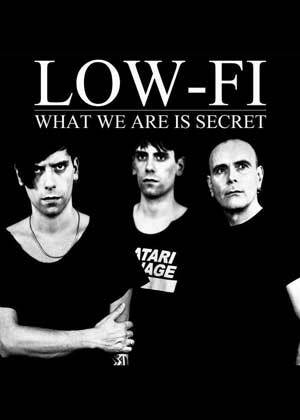 “What We Are Is Secret”, LOW-FI‘s first LP, is finally born. Time has passed since LOW-FI released first EP (Octopus Records 2010), during which the band has toured all over Europe increasing their musical perspectives and perceptions. It was an hard and long work, the band has looked deep into itself to find its very own and new identity. After year, in spite of the unexpected and enemies, LOW-FI have flied high releasing a melancholy, synthetic, dark and melodic LP, a mixture of Electro soundscapes enhanced by ‘whipcrack’ guitars and obsessive drum beats, songs that simultaneously throws back to 80′s genre pioneers and sounds very fresh, tunes with bite! The work was recorded at K-lab Studios, produced by Giuseppe Fontanella (24 Grana) and mastered at Swift Studio in London (Klaxons, My Vitriol, Pete & the Pirates). “Something”, the song that represented a watershed for their musical journey, Alessandro’s vocals dissolve in an electrical storm of synth and guitar walls. From the beginning you can feel the touch of the newcomer electrodesigner Fabio who has heavily influenced compositions like “Speed Control“ , “On the Scene“ and the post-punk influenced “Dead Disco Syndrome“. The sound changes frantically and sometimes it’s dancy (“Daylight“, “Forgiven“) and at other times quite dark (the gloomy “What We Are Is Secret“ and the goodbye song “Piano Metal“). You won’t be disappointed this debut collection songs from LOW-FI especially if you like The Bravery, Placebo, or She Wants Revenge. LOW-FI‘s debut album also has much more to offer: some band’s friends from Electro/New Wave european scene has made this record rich: No More, Schonwald, Din A Tod & SEXINSPACE have the hand in this work, “What we are is secret“ mesh all these inspirations together to share and give to the world something really personal. If you like rock, industrial, alternative or electro music with an easy catchy melody, you will find something to enjoy here.